The ideal onboarding experience is an easy and frictionless path to finding value. Consumer products perfected this by building onboarding experiences with maniacal focus on a single metric: Facebook’s 7-friends-in-10-days, or Pinterest’s 1rc7 (percentage of new signups that repinned a pin or clicked on a pin in the week following signup). But some products include irreducible complexity. When it comes to software for businesses, users often have to install the software, invite their team or message their customers. All of these are high consequence actions that deserve care and thought, if not review and approval. There are techniques that help to create the magic of a consumer onboarding flow in a complex product with considered actions. Here are five. For many complex products, the path to experiencing value requires designing customer messaging, onboarding a team, or installing software. These are high consequence actions, and a significant ask for a new user with little trust in your company. To combat a long path to value, find ways to clearly demonstrate how you deliver on your promises. An effective demonstration of value is specific to the user, as close as possible to the final product. If your product is a widget on the user’s website, let them configure the widget on a mock-up of their website, instead of a sterile settings page. 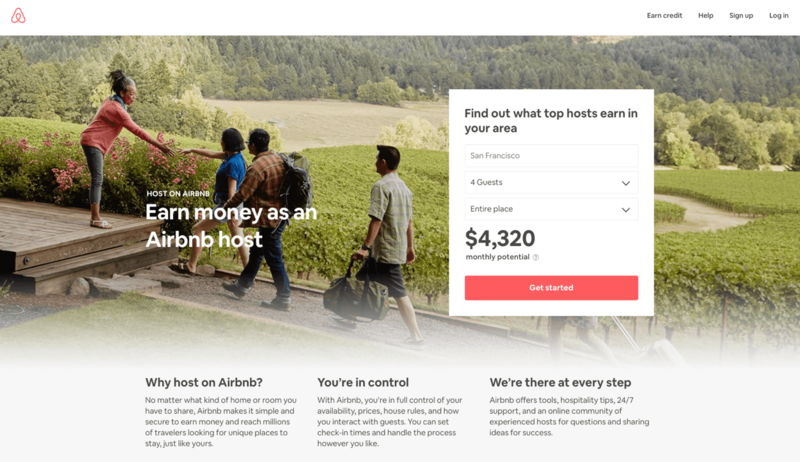 For instance, Airbnb makes benefits tangible by showing prospective hosts a specific, location-based estimate of how much they can earn. A common mistake companies make with onboarding flows is creating a tour of every feature your product teams have built. Brand new users are still evaluating your product, so your onboarding flow needs to be a compelling demonstration of how your product solves their problems. It’s unlikely that your UI is organized in this way: features and screens in your product don’t tend to map neatly to user benefits. While it’s important to explain the hierarchy and organization of your product, it’s irrelevant if customers don’t complete your onboarding process. The ordering of steps in your onboarding flow should be based around the problems that your product solves, not simply which screens are adjacent in your Settings page. 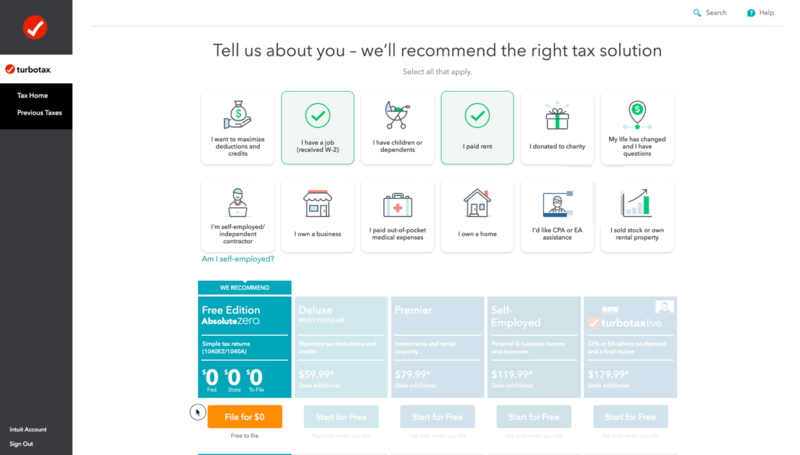 We can see here how Turbotax asks you what’s important and aligns their flow to benefits. In any process of adopting something new, all tasks are subject to anxiety and inertia, as well as the noise and distractions of day-to-day work. Templates, smart defaults and quality UX can reduce friction, but many tasks in the process of onboarding to a complex product are simply hard work. To keep users moving forward with your process, make sure the specific benefit of each task is clear. Benefits are good (do this to get that) but even better are hard claims (15 minutes could save you 15% or more), or short testimonials that provide social proof. Each of these help to motivate new users to overcome inertia and anxiety and move one step closer to activation. LinkedIn keeps their job database current by encouraging me to “strengthen my profile” so “people can find and connect with me”. Here, the microcopy explains the benefit to me of confirming my current title, rather than framing it in product-centric terms (e.g “Update your title”). If your product is used in a business setting, it’s likely that at some point it will involve a highly visible step, such as inviting colleagues, or taking an action that affects customers. These steps are anxiety-inducing and in larger companies can involve internal review and QA. In onboarding, delay is the enemy of success. You don’t want customers getting stuck trying to compose the perfect email during their first use experience, you just want them to be aware that this feature exists. So for potentially sticky tasks, explicitly let customers know that it’s okay to skip a task as they can always come back to it later. Or build in a way to reduce their anxiety. 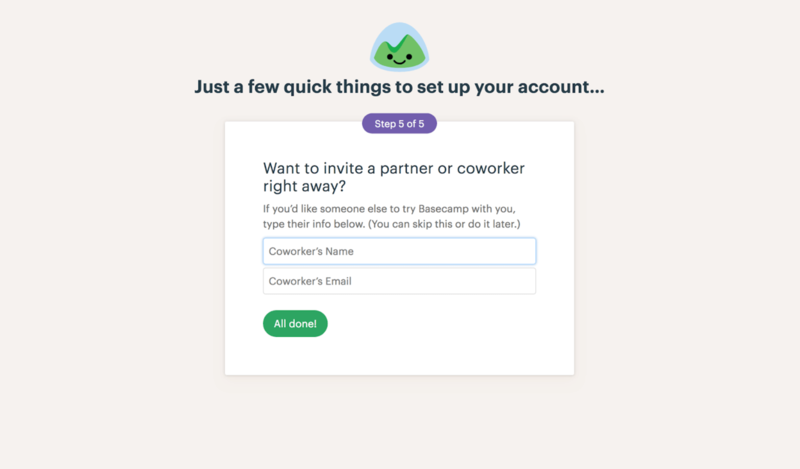 The example above shows how Basecamp strikes a balance between enabling new users to invite colleagues, but reassuring them that they can also do it later. Your onboarding process should help new users to snappily complete simple set up tasks, but allow them to tackle longer or more complex tasks (ie. creating content, installing software etc.) at their own pace. A great onboarding process guides customers through these non-button-clicking steps as well, for example using content that helps customers write a great email, or providing a QA checklist for installing a website widget. Doing this support ensures that your customers don’t get stuck on some of the hardest parts of the process. If you map the customer journey for your product, you’ll likely see that the process involves a number of steps that happen outside of your product. For an email product, users need to figure out what to write and who to send it to. Any team workflow product involves actually getting those teammates to use the product (and ensuring they also understand why they should sign up). 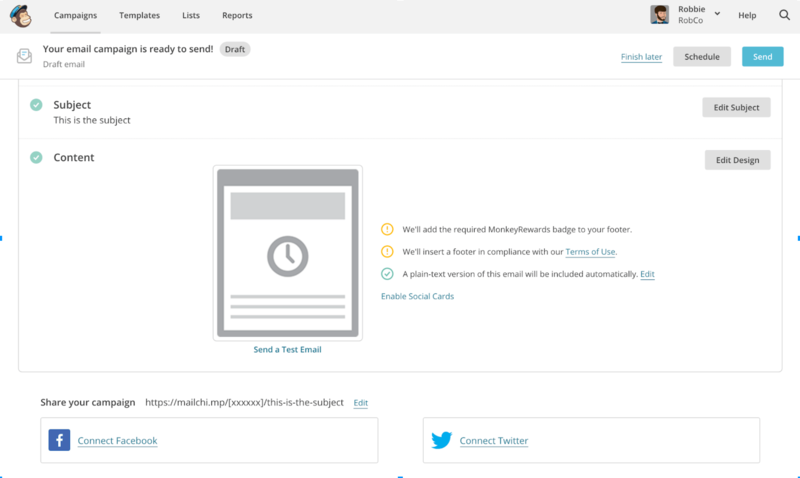 In the example above, we can see how MailChimp provides a subtle ‘Send a test email’ when a campaign is ready to send, enabling users who want to double-check their work the ability to do so – and then move forward.